Four years ago today, Akbar Mohammadi, a well known student leader died under very suspicious circumstances in the notorious Evin Prison. Mr. Mohammadi had been arrested during the July 9th 1999 pro-democracy student demonstrations that shook Iran and struck fear in the heart of the Islamic Regime. Mr. Mohammadi was charged with being one of leaders of the July 9th student uprising and was originally sentenced to death, however under international pressure his sentence was reduced to 15 years. Unfortunately I never had the opportunity to meet Akbar Mohammadi personally or speak to him; however I followed his work very closely. I’ve always considered him a true hero, because he remained defiant against the Regime even under the most brutal circumstances. I had the pleasure of reading his memoir where he described not giving in to the Regime and their requests, even though he knew he would face immediate torture and flogging. 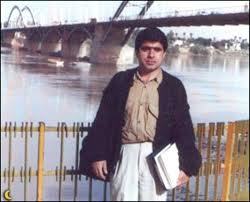 Akbar Mohammadi remained defiant throughout the seven years he spent in the Islamic Regime prisons, standing up for his own rights, rights of other political prisoners and the rights of the Iranian people. In July of 2006 he went on a hunger strike and died under very suspicious circumstances. Many including myself believe that he was murdered by the Regime while in prison, because he refused to cooperate with them. Today while many other prominent “student activists” who were arrested with him are free, living in Los Angeles of Washington and working with VOA, Akbar Mohammadi is gone… His memory however remains with us as someone who fought for what he believed in, and did not falter even in the face of intolerable hardships. In his memory and the memory of thousands of other freedom fighters who have lost their lives for a free and democratic Iran.